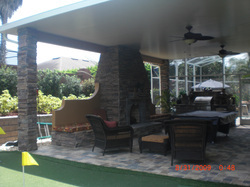 We build custom outdoor kitchens in the Orlando area. Brick Kitchen - Bricks have one of the finest exterior finishes when it comes to designing outdoor furniture. It can be even more beautiful if your home is already made of fancy bricks. It is also one of the most durable options of outdoor kitchens out there. Stone Kitchen - While bricks are quite fine and sturdy, stones look more artistic and closer to nature. Found in amazing colors of peach, grey, and cream these manufactured stone kitchen designs are quite a treat to look at and also with looks comes durability.